I am in a state of discombobulation as I find myself eye-to-eye with a pain-stricken Virgin Mary, six daggers protruding from her chest. To my right is a statue of a man about to lose his leg to what looks like a rabid dog; to my left, a collection of human bones. “They belonged to a Saint,” says our wild-eyed guide Daniella, “and so did these…” she adds, revealing more fragments of human bone gracing the walls in ornate frames. I am in the Rivalta Castle, an eerie private abode. Dating back to the 11th century it features everything from an armoury and dungeon to an honour chamber and Princess Margaret’s bedroom. It even boasts a frescoed dining room where magical walls transport a whisper from one corner to another, for the ultimate medieval gossip session. 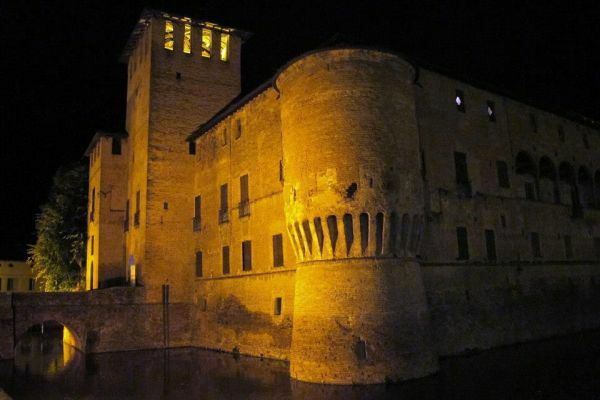 The striking property is just one of 647 castles, fortresses and towers peppered around the lush Emilia Romagna region. Once accessible to only the richest Italians, today the historic buildings house rare wine cellars, fascinating museums and luxe boutique hotels. In the shadows of the grand Rivalta Castle stands the Residenza Torre di San Martino, an ivy-covered hotel featuring ten elegant guest rooms boasting four-poster beds and views across to the beautiful castle. My geranium-fringed balcony made for the perfect spot to absorb the early morning rays and hear the church bells before breakfast. 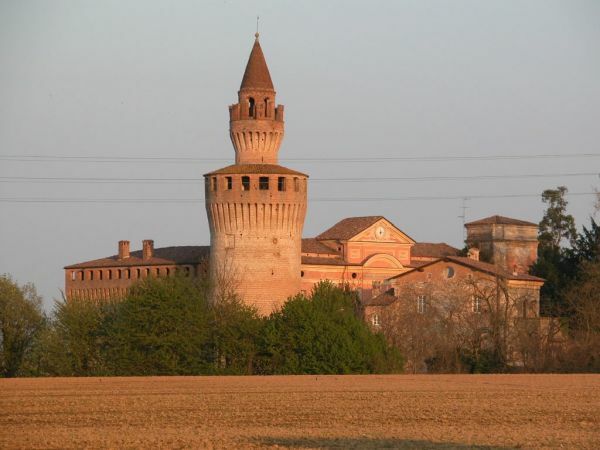 Just a short drive away on the banks of the River Po is the ancient town of Piacenza. 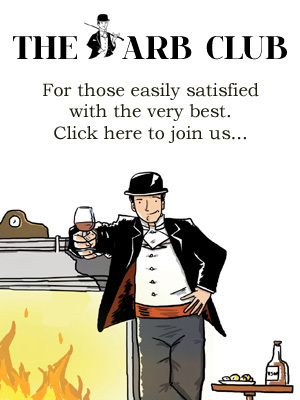 Its name derives from the Latin for ‘to please’, and it certainly does. This enchanting town of narrow alleys, gothic churches and independent eateries is often ignored in favour of its glamorous neighbour Parma – however, Piacenza is home to some of the best food in Italy, not to mention its rich history and world-class arts. 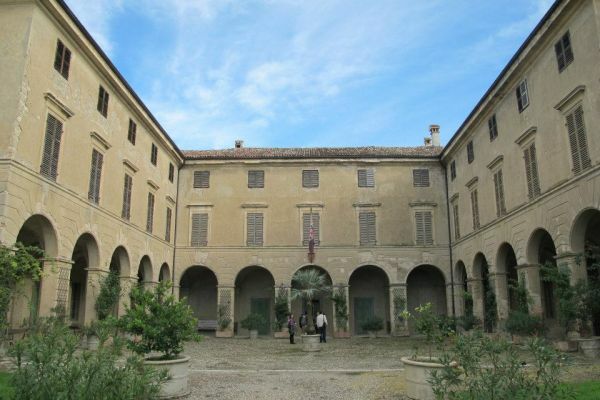 On the city’s northern borders stands Palazzo Farnese; the enormous building was originally designed as a court to the Duke of Piacenza and despite construction starting back in the 1500s, in true Italian style, it remains uncompleted to this day. Today the castle is home to numerous museums and galleries specialising in everything from frescoes and sculptures to a dedicated coach museum. If you only see one thing in the castle, head to The Gallery and admire Botticelli’s painting of Madonna and Child with the Young St. John the Baptist. Dating back to the late 1400s, its understated beauty is almost luminescent and still sits within its original gilded frame. In the old town, nestled amidst the Austrian-inspired patisseries and traditional espresso bars, hides the understated entrance of Antica Osteria del Teatro, run by Michelin-starred chef Filippo Chiappini Dattilo. The chic, dimly-lit restaurant offers a three-course set lunch with a glass of wine for just €30 making it one of the best value dining experiences in town. My seasonal pumpkin soup came with an enormous dollop of creamy gorgonzola and a drizzle of the area’s famous balsamic. After lunch Filippo – who has had Michelin stars hanging from his apron strings for quarter of a century! 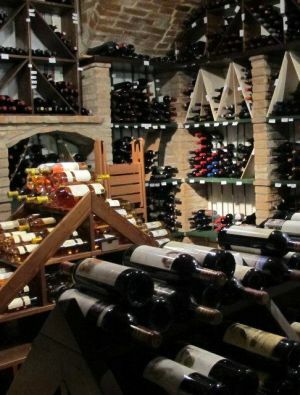 – gave us a tour of his real passion: his wine cellar. The immaculate room was stacked floor-to-ceiling with some of the oldest and finest wines in existence; some dating back to 1947! With the local lambrusco still dancing across my tongue I headed off to the tiny village of Agazzano, at the base of the Apennine Mountains. At the heart of Agazzano is, unsurprisingly, a castle. In fact, as with many areas, the village only existed as a result of the striking building. 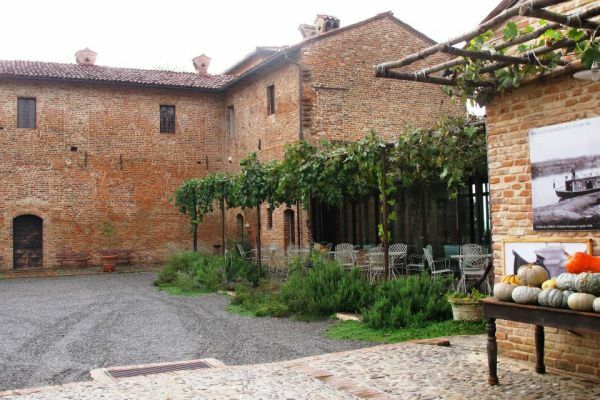 Dating back to the 13th century, the castle was built by the infamous Scotti family and remains in its possession today. While its fortress is frequented by fairy tale weddings, the ’villa’ remains a home, with its cellars dedicated to wine. It was a surreal experience and its handsome cashmere-clad owner led me through room after room of floor-to-ceiling frescoes, each with commanding views across the gardens and stables. After an afternoon of wine tasting we all fell in love with the Castello di Agazzano Bargello, and as we traipsed off in search of the award-winning local butcher laden with bottles of the red, we all decided that it was worth having to fly in every item of clothing we had brought if it meant we could squeeze an extra bottle into our cases. If meat is more your vice then Antica Corte Pallavicina is the castle for you. Located in the peaceful Parmense Lowlands it’s as famous for its immense culatelli cellar (6000 of the prized hams hang in a meaty dungeon below the castle!) as it is for its Michelin-starred owner and chef. Massimo and Luciano Spigaroli restored the 14th century castle from ruins and today it’s eclectic interior exudes character and comfort in every crevice, and its decadent bedrooms feature roll top baths, king-size beds and views across the River Po. The market garden was full of flowering courgettes and countless fruit trees on our visit. Unsurprisingly the restaurant is arguably the best place in the region to sample culatello, however on my visit Massimo had arranged a banquet with not one, but three fellow Michelin-starred chefs… in a neighbouring castle, naturally. Surrounded by a wide moat, the illuminated Castello Fontanellato is bursting with 16th, 17th and 18th century antiques, elaborate frescoes and dramatic family portraits. After a glass of the local frizzante in the courtyard with the local mayor, we took a tour of the grand interior before settling down to the dinner of all dinners. It was a satisfying moment when I realised I had experienced the work of five Michelin-starred chefs in less than twenty four hours. The next morning, still bursting at the seams from my royal feast, I headed to the beautiful terracotta-hued city of Parma. Having delved into the painstakingly pungent process of making Parmigiano Reggiano, I threw off my hairnet and plastic ensemble and headed for the city centre where our witty guide Melanie shared her passion for the city’s religious scene. “The cathedral is spectacular; I often visit,” she said, as we strolled through Piazzo del Duomo and passed its dramatic Romanesque façade, towards the pink marble baptistery. “I come every Christmas to mass here; it’s magical,” she continued, as we entered the peaceful building. Just as Melanie began to delve into the semiotic meanings behind the intricate paintings that adorned the ceiling, two burly German women next to us casually burst into deafening operatic song; their voices echoing around the tiny room. “Oh for God’s sake!” Melanie exclaimed, without a hint of irony. Her exasperation is valid, you see this has happened to us at every turn. The city’s streets are alive with Verdi at every corner. After hunching together in a rugby-style scrum in an attempt to hear her over the climaxing cadenza we admitted defeat and wandered next door to the cathedral. I’m not one for churches and cathedrals, they often fall off my itinerary, however Parma Cathedral’s extravagant gothic interior was breathtaking. At the far end of the echoing interior hides the dome; painted by Correggio, it is arguably one of the greatest and most controversial examples of Romanesco art. The masterpiece, depicting the Assumption, has been met with bemusement over the years; with one contemporary comparing it to a “bowl of frog soup” and Dickens himself commenting that it looked like a “surgeon’s nightmare”, with arms and legs flailing everywhere. Well, it may not be good enough for Dickens, but I know two Germans who would love the acoustics!